Toothpaste: it whitens, brightens, deodorizes, removes stains, and restores and protects enamel. But toothpaste's cleaning capabilities work wonders on many things besides our teeth. The same ingredients that help polish our pearly whites can also soothe some common ailments, make household items sparkle, and even get rid of stains and pungent smells. Try out these fifteen tricks with a white, non-gel toothpaste (unless otherwise noted), and watch that cavity-fighting, breath-freshening tube of wonder work its magic. 1. Relieve irritation from bug bites, sores, and blisters: These skin irritations all tend to weep and, in the case of bug bites, often itch. 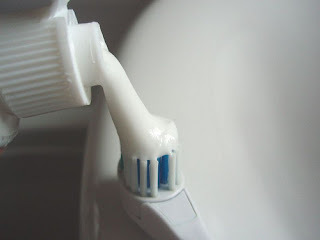 Apply a drop of toothpaste to a bug bite or insect sting to stop the itching and decrease any swelling. When applied to sores or blisters, it dries them up, thus allowing the wound to heal faster. It's best when used overnight. 2. Soothe a stinging burn: For minor burns that donot involve an open wound, toothpaste can deliver temporary cooling relief. Apply it delicately to the affected area immediately after a burn develops; it temporarily relieves the sting and prevents the wound from weeping or opening. 3. Decrease the size of a facial blemish: Want to speed up the healing of a zit? Apply a tiny dot of toothpaste to the affected area at night before bed. Wash it off in the morning. 4. Clean up your fingernails: Our teeth are made of enamel, and toothpaste is good for them, so it stands to reason that toothpaste would also be good for our fingernails. For cleaner, shinier, and stronger nails, simply scrub the underneath and tops of fingernails with a toothbrush and toothpaste. 6. Scrub away stinky smells: Garlic, fish, onion, and other pungent foods can permeate the skin cells on our hands. Scrubbing hands and fingertips briefly with toothpaste removes all traces of smelly odors. 7. Remove stains: Toothpaste can make tough stains on both clothing and carpets disappear. For clothes, apply toothpaste directly to the stain and rub briskly until the spot is gone, then wash as usual. (Note that using a whitening toothpaste on colors can sometimes bleach the fabric.) For carpet stains, apply toothpaste to the stain and scrub it with an abrasive brush, then rinse immediately. 8. Spruce up dirty shoes: This tactic works great on running shoes or scuffed-up leather shoes. As with carpet stains, apply toothpaste directly to the dirty or scuffed area, then scrub with a brush and wipe clean. 9. Remove crayon stains on painted walls: Rub a damp cloth with toothpaste gently on the marked-up wall and watch the Crayola marks disappear. 11. Remove scratches on DVDs and CDs. This remedy has been used with mixed success rates, but it seems to work fairly well on shallow scratches and smudges. Apply a thin coating of toothpaste to the disc and rub gently, then rinse clean. 13. Deodorize baby bottles: If baby bottles develop a sour-milk smell, a good cleaning with some toothpaste and a bottle scrubber will clean away residue and deodorize. Always make sure to rinse well. 14. Remove the burned crust on irons: For those of you who still use an iron, you may find that after time, the plate of the iron develops a burned crust. The silica in toothpaste gently grinds away this rusty-looking layer.